This tour covers the northern portion of the Westcott neighborhood which is also the oldest settled and built-up. The tour begins at Westcott and Dell Streets and proceeds north along Westcott Street past Hawthorne, until East Genesee Street. The tour heads west along East Genesee Street until Columbus Avenue, where it turns south and climbs the hill, and proceeds across Hawthorne Street all the way until Dell Street. 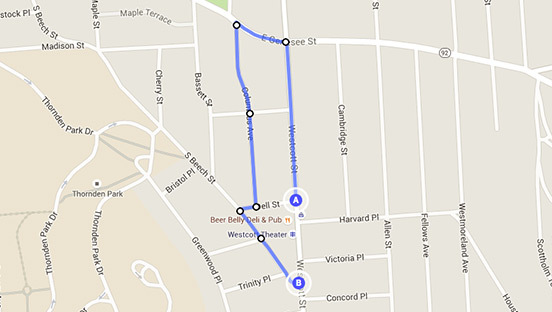 After looking at the houses on Dell street, the tour jogs slight west to South Beech Street. There is a slight detour north on South Beech, before returning past Dell Street and continuing until the intersection of South Beech and Westcott Streets. Westcott Street was laid out and graded in the 1870s and 1880s as a straight north-south route from the Erie Canal into what was still partly undeveloped farmland. The street is named after engineer/inventor, noted dentist and Syracuse Mayor Amos Westcott (1815-1873). 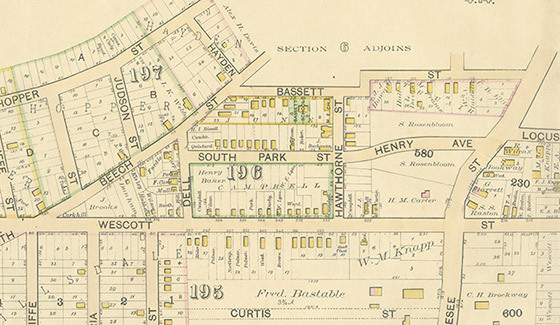 Westcott Street was extended from Fayette St. to East Genesee St. in 1872, and further south in the following decade as far as the Syracuse Driving Park just south of Phelps Street (now Harvard Place); a popular destination. The East Genesee Street railroad tracks were extended to Westcott Street and the Driving Park in the 1870s. George Tillson, in his 1912 book Streets Pavements and Paving Materials wrote of street-car development that “it is well recognized at the present time that no one thing tends to develop and build up a city as does a good system of street-cars.” This was certainly the case in the Westcott neighborhood which became one of Syracuse’s earliest “Streetcar Suburbs”. The addition of paving and sidewalks to the street came gradually, but was mostly complete by around 1900. The Evening Herald (April 4, 1890), reported that residents (probably of the area from Fayette Street south to Dell Street) had petitioned the city for paving either in asphalt, asphaltina, or vitrified brick. Over some local protests, the city awarded the contract to the low bidder for asphaltina. At the time public works contracts, especially those concerning streets and water, were highly politicized, and were plum patronage prizes. 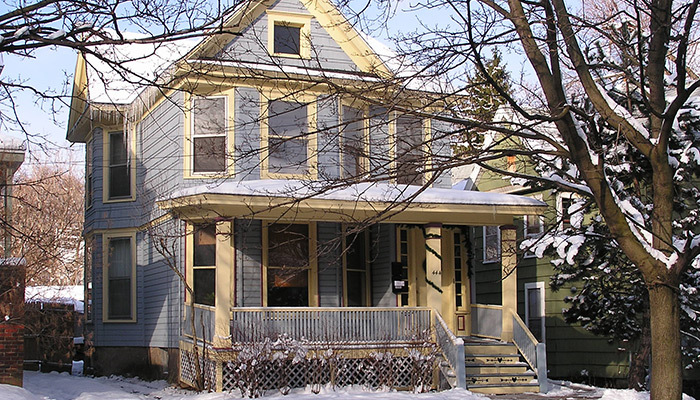 The area north of Hawthorne to East Genesee Street was mostly developed after 1892, when only two houses stood on the west side and one on the east side of Westcott Street. Most of the land on the west side was owned by H. M. Carter, and the tract on the east side was owned by W. M. Knapp. Some of the houses, especially those at the northern end of the street, are quite substantial. All of the lots along Westcott Street are very deep, so often substantial carriage houses and garages were erected toward the rear of the lots. Some of these are still visible, and some have been converted into residential units. Hawthorne and Bassett Street was the location of the neighborhood’s earliest church. Erwin Methodist was founded here in 1889. In 1897 the church sold the lot to the city as the site of the new Bassett School, the first in public school the neighborhood. The wood frame church building was moved slightly southeast to the corner of Phelps Place (now Harvard) and Westcott Street. The congregation moved again to its present location on Euclid Ave. in 1914. All the houses in the area are wood frame structures and many were originally decorated with scroll work, varied shingle shapes and patterns, a variety of window shapes and sizes, and ample porches. All of these features can be seen here and there, but only a few houses maintain all of their original features intact and visible. Many houses have been covered in vinyl siding in recent years, and this most recently includes the Levi S. Chapman house at #321. In many cases, however, the original clapboard and shingle siding is hidden beneath. The former Archer Babcock House (now known as the Babcock-Shattuck House) next to the Chapman House at the corner of Westcott and East Genesee Streets has been recently restored so than, giving some indication of the former beauty of these residences. Most of the lots between Hawthorne and Dell Streets were built up during the 1880s and houses are shown on these lots in the 1892 map. Some of these were built on double lots, so that later infill houses were erected, mostly in the 1920s. In September 1929, Dell Street residents celebrated (with 26 musicians and a “block dance”) the inauguration of a new special lighting system by the Syracuse Lighting Co. The area between Dell and Hawthorne Streets on the west side was the Campbell Tract, and this extended back to South Park Street, now Columbus. On the Westcott side of the tract all but two lots were built by 1892. On the east side between Dell and Hawthorne the area was also subdivided, with deep narrow lots. Almost every other lot was built by 1892. The houses were longer than those across the street, but otherwise stylistically similar. This land had been part of the Palmer Tract, while part of the Bastable Tract ran behind these houses on a strip fronting what was planned in 1892 to be Curtis Street, and is now Cambridge. In 1890 there is mention of a land transfer by “Ira A. McCarthy to Caroline M. Palmer, of lot 22, Palmer tract, Westcott St., city”. In 1892 three lots are labeled Palmer. In 1893 Louis Waters transferred to Cora Waters lot 16 of the Palmer Tract on Westcott street. Later the same year Kate D. Thorburn transferred to Cora M. Waters lot 17 for $1.00, enlarging her parcel. In 1899 a grocery owned by A. F. Rown & Son operated at 400 Westcott Street, presumably at the corner of Hawthorne. This may have been the earliest commercial venture on Westcott Street.